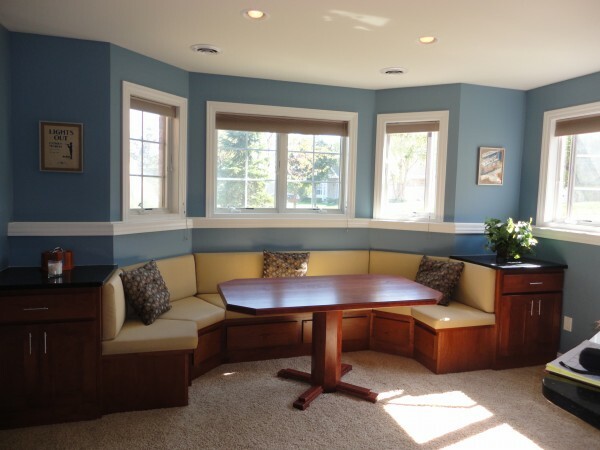 These young and outgoing clients wanted a space for entertaining friends and coworkers in their Madison, WI home. The entertaining space was the focus of this basement renovation. It was always the couple’s dream to have a built-in seating booth in their basement. The basement is where they did a large amount of their entertaining – watching movies, playing board games, and relaxing with good company. Overall, they wanted a more functional space, making it easier to converse with guests. On either side of the booth seat, there are cabinets for all of the couple’s games and drink coasters. The custom cherry table finishes the space off. The table pedestal was designed to allow for easy movement into the built-in seating area without hitting feet. We added a wet bar to the basement, complete with a bar sink and mini fridge. It’s a great space for the couple to mix drinks for company. The custom glass shelves beautifully display their collection of souvenir mugs and steins. In addition, the mirrors in the center of the bar back create a focal point. Another space this couple used for entertaining was the kitchen. We had designed it years ago, but it was in need of a wine bar. 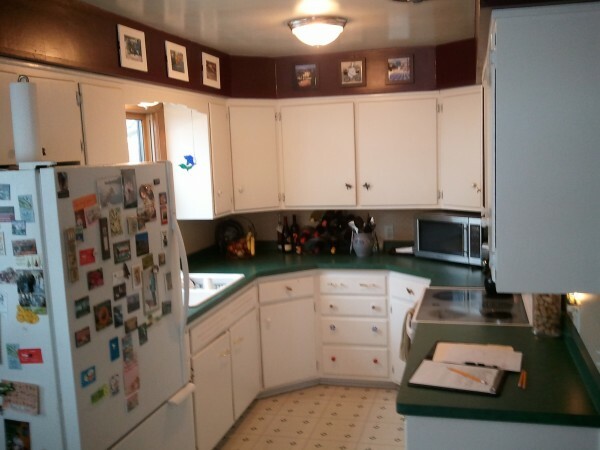 We filled a blank wall with cherry cabinetry to match the rest of the kitchen. The wine bar is complete with glass doors and wine racks. From the basement to the kitchen, this couple finally has all of the entertaining space they need! 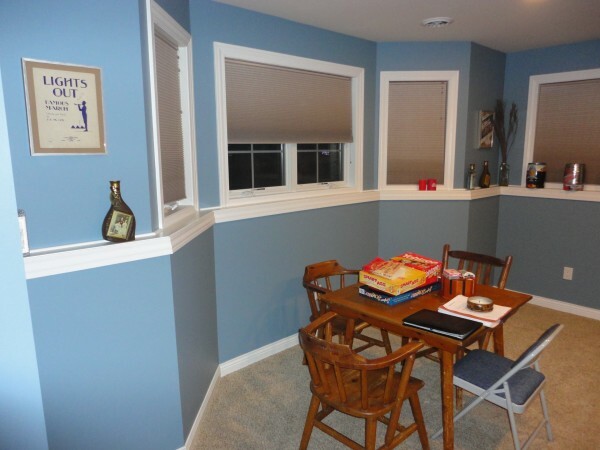 To see more project photos, visit our Basements page. This home came equipped with a very small kitchen. The walls went all the way around this small kitchen, dividing the spaces between the living and dining areas and kitchen work space. This created inconvenience for the homeowners as they had to walk all the way around their kitchen in order to set food on their dining table. It was the home owners’ dreams to see the room opened up. They decided on a plan for a kitchen with a peninsula at the end, next to their dining table. This would allow for very easy access into the kitchen from the front of the house as well as from the dining room and living room in the back of the house. We started demolition and “SURPRISE!”. The wall we were knocking out was supposed to be a supporting wall, but it had been torn out by previous home owners or was never equipped with the proper support. With some very creative engineering, the owner of A Better Home came up with a plan that would support the house without even touching our plans for the kitchen remodel. As a result, there isn’t even be a beam showing in the kitchen! We removed their side door and stoop from their kitchen space to gain more space for their refrigerator. The front of the kitchen now houses a small breakfast nook. It can also double as a place to work on bills and mail. 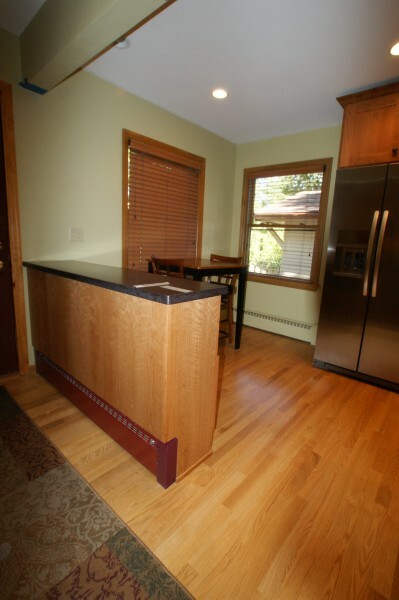 The owners decided on a natural stained cherry cabinetry, which just doesn’t ever seem to go out of style. The counter tops they chose were a dark solid surface with copper flecks. They have a matte finish which is easier on the eyes. We had to vent the hood to the exterior through the floor joists and a cabinet. We built a back onto the cabinet so that the owner could see everything in the cabinet just by standing in front of it. 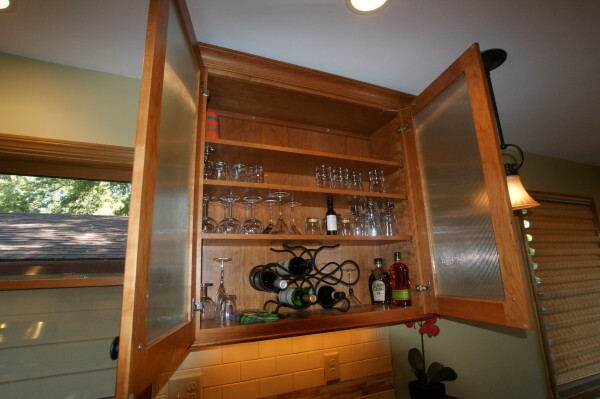 In addition, it works as an excellent pantry and cupboard for measuring cups and spoons. The homeowner also added a microwave cabinet in the peninsula so that it was easily accessible but out of sight. The cabinets around the sink area feature reeded glass, which is a glass type used at the time of the home’s construction. The simple shaker cabinet doors compliment their style and provide a timeless look. 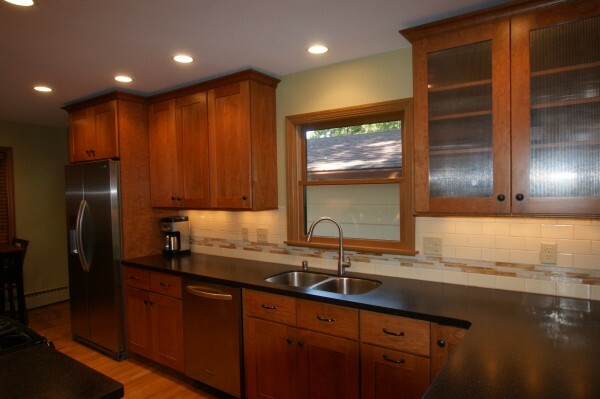 Furthermore, they lightened up the kitchen with a light back splash – cream subway tiles and milk glass mosaic. To see more project photos, visit our Kitchens page.